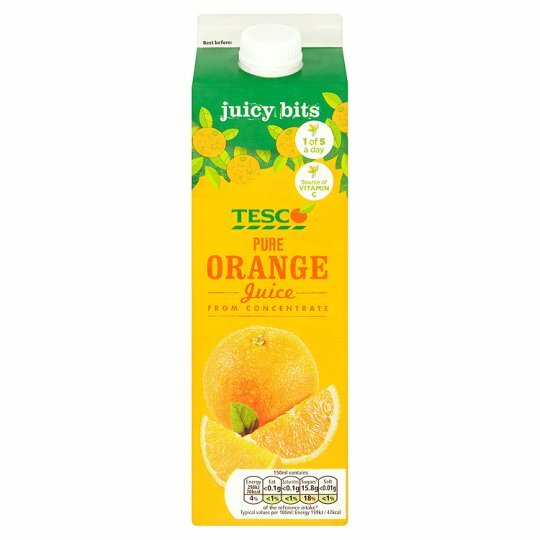 Orange juice from concentrate with added orange bits. Only the best quality fruit makes the grade for our juices. We squeeze or press it only when it's perfectly ripe and at its tastiest. Concentrating the juice reduces the amount we transport, which means it's better for the environment. Then we replace the water later, and pasteurise the juice. Nothing but water is added or taken away – so you get nothing but the full flavour of delicious sun drenched fruit. Keep refrigerated. Once opened, consume within 5 days., Best before: see top of carton. Shake well before opening and pouring.